Was Scottish Adventurer Sir Fitzroy Maclean the real-life prototype of James Bond? With typical sang-froid in the face of danger (plus a dram of understatement), thus writes Sir Fitzroy Maclean, Scottish adventurer, diplomat, soldier, secret agent, and possible real-life prototype of James Bond. Brothers Ian Fleming and Peter Fleming were most certainly familiar with Fitzroy’s exotic forays into international intrigue. (Peter Fleming in fact wrote his own travels in Central Asia in the 1930s called News from Tartary and A Forgotten Adventure.) Strangely, Maclean’s book Eastern Approaches (1949), one of the best adventure travel books ever written, even now is relatively unknown in literary writing circles. I first discovered this lost neglected classic at a library sale in Westfield, New Jersey, about twenty years ago. It was a Time Inc. edition with minimal cover art. The spine was cracked; there were no cover blurbs or reviews. I might not have read it all had it not been so cheap (one dollar for a bagful of books). After I read Eastern Approaches in a flurry of feverish nights, growing more and more excited about this new find—that is, the T.E. Lawrence-like Maclean—the book fell apart in my hands. Gone for good. But now in the Information Age, with the help of Google and Amazon, I recently was able to locate a Penguin reissue of this nearly lost work of literary adventure, comic genius, and historical pathos. I wanted to learn more about the larger-than-life Fitzroy Hew Royle Maclean, whose interest in “gels”—particularly pretty “American gels”—drew him from Britain to the fleshpots of Paris, the diplomatic circles of Russia, and the warfronts of World War II. In the case of Maclean, history and writing collide in an awesome case of British literary traveling. Whether he is discussing the Stalinist purges of the 1930s or the routing of the Wehrhmacht in Yugoslavia, Maclean’s acerbic eye lets no telling details escape. To call Maclean a master of understatement would be an understatement. He takes no prisoners in his prose. He dares to dream with his eyes wide open. The only problem: the region was forbidden to foreigners. During his clandestine departures, or “eastern approaches,” into a land where Marx meets Mohammed and Genghis Khan citadels clashingly coexist with Communist Parks of Rest and Culture, Maclean describes meetings with Tatars, Uzbeks, Kazakhs, and Mongols as well as European Russians. He describes the peasants, deportees from Stalinist Russia, riding in a “hard” carriage: “gnarled beings whose drab, ragged, sweat-soaked clothes exhaled a sour odour of corruption, and who . . . had a strange troglodyte appearance.” Everywhere he travels, surreptitiously and surreally trailed by NKVD agents (as James Bond was trailed by SMERSH), he turns the local populace into comedic gold. There was always, so travelers in Imperial Russia tell me, an old Russian smell made from the scent of black bread and sheepskin and vodka and unwashed humanity. Now to these were added the more modern smells of petrol and disinfectant and the clinging, cloying odour of Soviet soap. The resulting, slightly musty flavour pervades the whole country, penetrating every nook and cranny, from the Kremlin to the remotest hotel in Siberia. The general atmosphere is evocative of a James Bond movie, like From Russia With Love, wherein the reader expects Maclean to be attacked at any moment by a blonde femme fatale Aeroflot stewardess in spiked stiletto heels. But was Maclean the real-life original 007? A quick rereading of the Bond oeuvre, with their ludicrously unbelievable (but entertaining) plots—Dr. No, From Russia With Love, Goldfinger, Diamonds Are Forever, Casino Royale, and Moonraker—suggests there is no connection literarily between the made-up Bond and the real-life Maclean. (I read Moonraker, for example, without finding any literary correlations.) 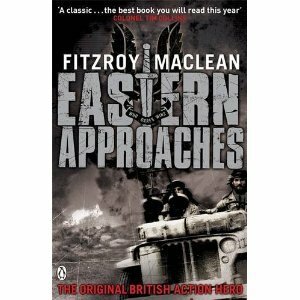 However, while rereading Eastern Approaches, time and again one imagines the the suave, sophisticated Maclean being played by Sean Connery, outwitting nefarious hooligans in foreign climes, smiling in the face of danger, grimacing over each romantic conquest, ready to punctuate a suspenseful moment with an understated jest. In other words, the character of Bond is the ulterior image of Maclean. Interestingly enough, though they were both asked about it, neither Ian Fleming noir Fitzroy Maclean ever confirmed or denied that the book series was loosely based upon Maclean’s life maneuvers. Even if tenuous, silence is often affirmation. “I said that I, too, hoped they would not,” Maclean dead-panned. Transferred back to London in 1939, while trouble brews worldwide, Maclean decided to join the war effort. He escaped from his diplomatic duties by running for Parliament and was elected a Conservative MP for Lancaster (a seat he would hold until 1959). Then, apropos of nothing, he joined the Cameron Highlanders as a private. So a diplomat turned into a “desert rat” specializing in commando raids behind enemy lines. A founding member of the SAS (the British equivalent of the Green Berets), which he joined in 1942, Maclean took part in raids in the Middle East and behind Rommel’s lines in North Africa. Downplaying his suffering, Maclean desribed, in Bond-like fashion, one of his raids 600 miles behind enemy lines as “something of an ordeal.” Other energetic feats featured a day-long stay among the Afrika Corps in Benghazi, straight out of Lawrence of Arabia, and a kidnapping mission of an Iranian general collaborating with the Germans. Later, in 1943, Maclean was air-dropped into German-occupied Yugoslavia as Winston Churchill’s personal representative and leader of the British Military Mission to the Partisans (a mission that Evelyn Waugh participated in). He avoided capture throughout the entire period of the war. The book recounts this swashbuckling war hero’s life, right in there in the thick of it, during this difficult period in world history. He is not only a spectator of the world scene but a participant in history itself, worthy of repeating. While interesting to military historians, the second half of Eastern Approaches—which abruptly ends with Tito in power, resplendent in his palace and marshall’s uniform, as Maclean departs from Yugoslavia—is just not as much fun as the first half, although there is, I suppose, more “action.” Eastern Approaches, which was called Escape to Adventure in its American version, nevertheless ranks as a travel classic, not merely a war book or memoir par excellence. Maclean ranks right up there with Eric Newby, Evelyn Waugh, Graham Greene, and Wilfred Thesiger as an author of a book for the guest-room bedside table. Maclean’s humor, acute eye for detail, and nervy escapades enhance the story of very serious military and diplomatic undertakings. Whether in Kazakhstan or the Altai Mountains, braving bad food, lice, undependable transport, and bureaucratic foul-ups, Maclean dares to live a life of adventure so many of us dream about and aspire to—a quest for zest. How many of us have drunk the Dalmatian wine known as Grk or swum in the Adriatic after weeks of bathless discomfort in war-torn Europe? Thankfully, Fitzroy Maclean, master of understatement, an “Englischer Diplomat mit Monokel” (according to a German girlfriend), wearing a kilt, shaken by danger, stirred by adventure, also had canny narrative gifts and a good sense of humor. Plus, a keen eye for the gels. Bio: John M. Edwards has traveled worldwidely (five continents plus), with stunts ranging from surviving a ferry sinking off Siam to being stuck in a military coup in Fiji. After graduating from Tulane University in New Orleans, he worked as an editor at Pocket Books and as a copyeditor at Emerging Markets, covering IMF/World Bank meetings overseas. His writing has appeared in Amazon.com, CNN Traveller, Missouri Review, Salon.com, Grand Tour, Islands, Escape, Endless Vacation, Condé Nast Traveler, International Living, Emerging Markets, Literal Latté, Coffee Journal, Lilliput Review, Poetry Motel, Pure Travel, Smoking Poet, Eclectica, Essays and Fictions, Artdirect, Glimpse, Verge, Slab, Stellar, Trips, Travelmag, TravMonkey, Traveling Stories, Danse Macabre, Smoking Poet, InTravel, Mango, Mabuhay, Big World, Vagabondish, Glimpse, BootsnAll, HackWriters, Road Junky, Richmond Review, Adventure Journey, DVD Express, Borderlines, ForeWord, Go Nomad, North Dakota Quarterly, Michigan Quarterly Review, and North American Review. He recently won a NATJA (North American Travel Journalists Association) Award, a TANEC (Transitions Abroad Narrative Essay Contest) Award, a Road Junky Hell Trips Award, a Literal Latté Travel Writing Award, a Trips Millenium Contest Award, a Bradt Independent on Sunday Travel Writing Award, and three Solas Awards (sponsored by Travelers’ Tales).